You like historical fiction. This book is set in Russia in the late 1890s and has everything you could want from beautiful gowns, to excitement about the new technology of photography, to horse drawn carriage journeys. Akunin does not stint on cool historical details. You've already finished binge-watching Father Brown on Netflix and need a new fixation. Like Father Brown, Sister Pelagia is an ecclesiastic with a talent for ferreting out mysteries. Always kind, and sometimes a bit on-the-nose, she won't stop until she figures out every little detail. You love quirky characters. Almost every character in this book is unusual in some manner. Sister Pelagia is a nun-detective, encouraged in her endeavors by the paternal Bishop Mitrofanii. The titular bulldog belongs to the Bishop's eccentric great aunt who has turned her husband's passion for dog breeding into a ridiculous obsession. The country town that is the main setting of the book is full of unique secondary characters that add charm and depth to the mystery. Once I got settled into the cadence of Russian translated into English, Sister Pelagia was a lot of fun to read. If you enjoy Sherlock Holmes stories or other period mysteries, give this one a try; I bet you'll like it. In a remote Russian province in the late nineteenth century, Bishop Mitrofanii must deal with a family crisis. 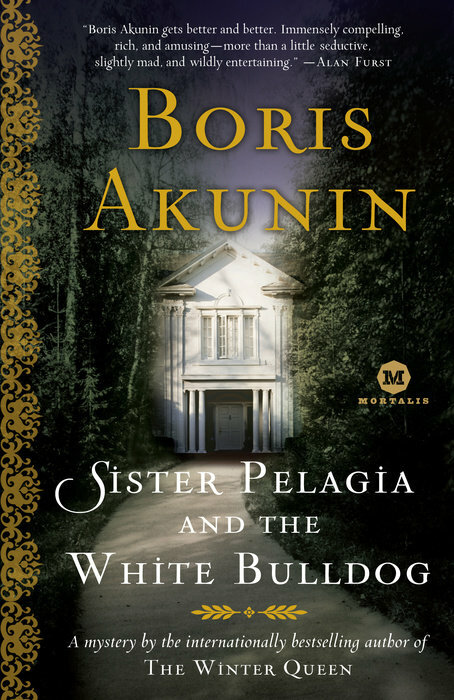 After learning that one of his great aunt’s beloved and rare white bulldogs has been poisoned, the Orthodox bishop knows there is only one detective clever enough to investigate the murder: Sister Pelagia. The bespectacled, freckled Pelagia is lively, curious, extraordinarily clumsy, and persistent. At the estate in question, she finds a whole host of suspects, any one of whom might have benefited if the old lady (who changes her will at whim) had expired of grief at the pooch’s demise. There’s Pyotr, the matron’s grandson, a nihilist with a grudge who has fallen for the maid; Stepan, the penniless caretaker, who has sacrificed his youth to the care of the estate; Miss Wrigley, a mysterious Englishwoman who has recently been named sole heiress to the fortune; Poggio, an opportunistic and freeloading “artistic” photographer; and, most intriguingly, Naina, the old lady’s granddaughter, a girl so beautiful she could drive any man to do almost anything.